A beautiful woman whose bizarre lifestyle may hold the key to finding the killer. No wonder Carver feels exposed, and that’s not counting the young girl whose life he’s trying to save from ruin, or the ambitious colleague scheming to bring him down. As the kill-count mounts, evidence points to a link between the ‘Worshipper Killings’, and Carver’s last, ‘big case’. And when the killer strikes at the heart of the investigation, Carver knows that in order to protect those closest to him, he must confront what he most fears – his own failings. 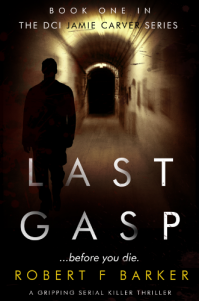 Written by someone with first-hand experience of running major crime investigations, LAST GASP is a suspense-filled novel of murder, sexual-intrigue, and human weakness. It is a story about one man’s struggle to put the past behind him, and save those he loves.